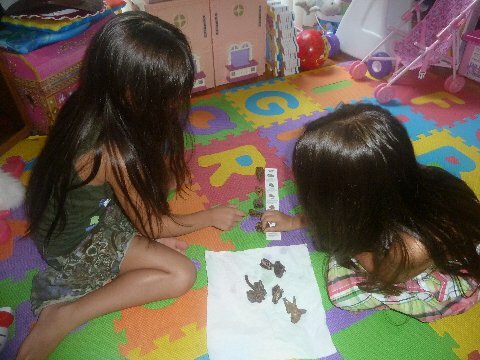 You simply can't teach kids about dinosaurs without letting them do a Dino Dig of some sort! I have been waiting for the opportunity to let the Lil Divas excavate items out of ice and this seemed like the perfect time! Why not freeze our dino bones and let them do an Ice Age Dino Dig?! FUN! 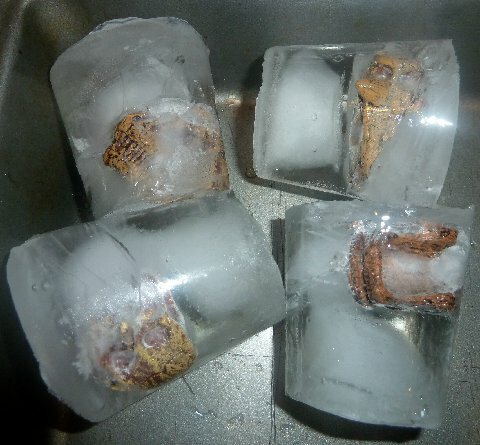 I used the above dinosaur skulls and froze them in small dixie cups. 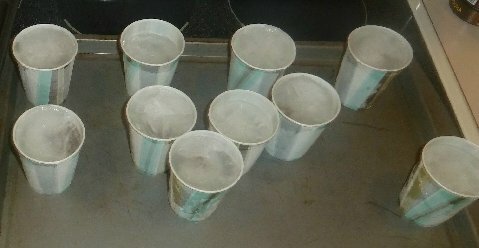 I froze a little water first then added the skulls and topped with more water so that they were mostly in between the ice blocks. I left some of the skulls on top and some near the bottom as well for a mix. The Lil Divas used blunt kiddie knives to pick at the ice and warm water to melt it. 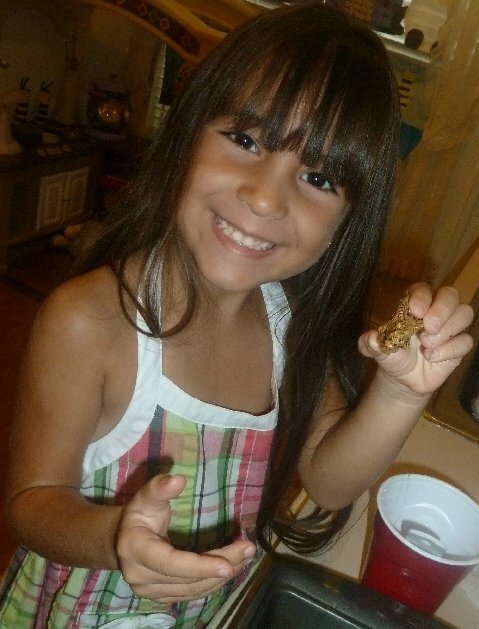 The Lil Divas were so excited to excavate the skulls. It was a fabulous activity. Once all the dino skulls were out, we matched them up on the card that came in the toob and read about each skull. Have you done any fun ice excavations or dino activities with your kids lately? I'd love to hear about them. Bern, that is such a fun idea. 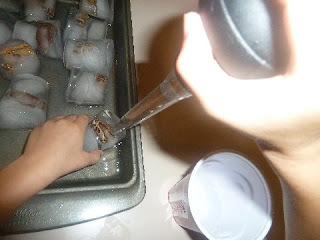 This is the second ice idea I have seen for kids over the last week. I love it! great idea! WE are doing 10 terrific weeks of dinosaurs now, I think I'm gonna give this a try! My kids love playing with just plain old ice. I'm sure they'd be thrilled to work in a little paleontology. This was a great idea! I'd love to try it too! I love this idea! I bet they did too. i'll have to try this one!!! 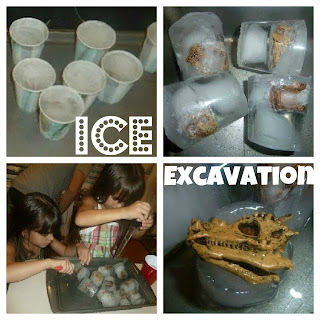 neat activity - not only "cool" learning about dinos, but a good activity in patience, too! 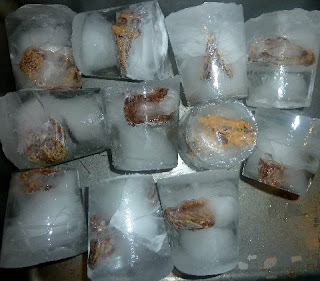 I've seen the ice excavation thing before, but this is sooo cool! What a neat idea! My boys love dinosaurs. They would have a blast with this! What a great idea! We're talking about dinosaurs this week and this will be FUN! I love this activity, it is so fun and realistic! 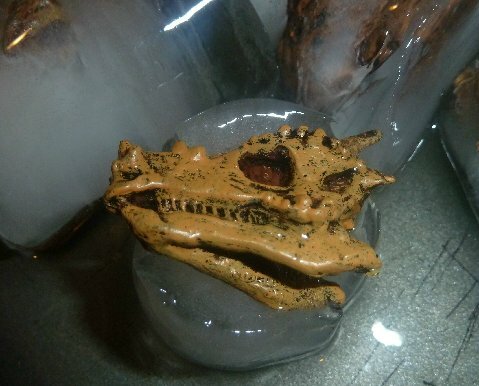 I featured it today (as well as your Dino Math) over on my blog today! Thanks for all the fantastic ideas! 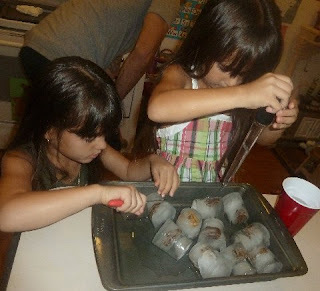 I did this with my preschool kids and they loved it! Thank you so much for the idea. This is wonderful... just one question... Where did you get the wonderful skulls?